Charter restored 1821; returned to Grand Lodge 1832 or 1833, per 175th Anniversary History, Page 1973-199. R. W. Elijah Swift, M.
W. Timothy Crocker, S. W.
W. Stephen Swift, J. W.
Franck Wicks, P. M., Tr. By R. W. William H. Hewins. The petition was duly presented and was granted on the date of March 13, 1798. It was signed by the following Grand Officers: Josiah Bartlett, M. W. Grand Master; Samuel Dunn, R. W. Deputy Grand Master; Joseph Laughton, R. W. Senior Grand Warden; William Little, R. W. Junior Grand Warden; Daniel Oliver, Grand Secretary. Frank Wicks, Treasurer pro tem. Hugh Donaldson, Secretary pro tem. During this meeting the following vote was passed: "Voted that every visiting brother should be allowed to make one visit free of expenses, but every other visit he should pay 25 cents, unless otherwise determined by vote. They continued to meet at Brother Swift's until sickness in his family compelled them to meet elsewhere. They next met at the house of Samuel Shiverick, in the southwest upper chamber. Brother Shiverick's house is the old house next west to the Post Office in Falmouth Village. They continued to meet in dwelling houses in various parts of the village until the new building was completed in 1801. A meeting of the subscribers for the new building was held September, 1798. "We the subscribers jointly and severally agree and engage to pay the sums annexed to our names by us subscribed into the hands of the committee who may be appointed to carry on the building of a School-house where the old one now stands. "Which is divided into eighty shares, in company with the Masonic Society if they choose to join us, also the town so far as they may agree for the benefit of a town house. A list of subscribers for building a School House in the town of Falmouth and what number of shares each one has and money paid one whole share being $7.42. "Voted, that the Proprietors of the Schoolhouse and the Masonic Society complete the outside of the building and lay the floors equally between them. "Voted, One half of the money be paid down, and the other half when the outside of said house is completed. Elijah Swift's proposal being the lowest he was awarded the contract, it being for $675. "Voted, that Capt. Timothy Crocker receive the money and pay it over to Elijah Swift, and sign the agreement with the said Swift for completing the building agreeable to contract." At a Proprietors' meeting, held at the Inn of Shubael Hatch, August 19, 1800, it was voted that the sum of $15 that the old building sold for, be paid to Elijah Swift for two feet in addition to the width of the new Schoolhouse. On completion of the new building the Town occupied the lower rooms for school purposes. The Lodge occupied the upper room, and continued to occupy it until about 1810, and then for some reason not given, they returned their Charter to the Grand Lodge, where it remained until 1820. 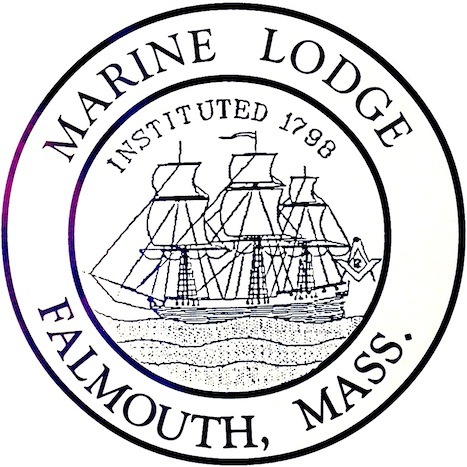 ("A communication was received from the officers and members of Marine Lodge, at Falmouth, representing the situation of that Lodge; requesting leave to return their Charter to the parent Grand Lodge, and offering as reason for so doing, the impoverished state of their finances, the absence of many of their Brethren, and other inabilities which prevented their meeting at present and discharging their regular dues. The members of Marine Lodge were mostly seafaring men." — F. W. H. September 10, 1810; I Mass. 442. Then it was again returned to the Lodge and they continued to meet until about 1832 or 1833. Then the Charter, working tools, and jewels were again returned to the Grand Lodge and remained there until 1857. After giving up their Charter the building was sold to Thomas Swift who rented the lower rooms for store purposes, and the upper hall for a school room. It was so occupied until a new Schoolhouse was built. In 1857 a petition was drawn up by the old members of the Lodge and forwarded to the Grand Lodge asking that their Charter and records be returned and permission given to reorganize once more. The petition was granted and a new Lodge was formed under the old Charter. The first meeting of the Lodge after the Charter had been returned was held at the house of Bro. Albert Nye, opened on the first degree. His house was the one now owned by Harry V. Lawrence. Applications having been received from James T. Dillingham, Thomas L. Swift and Solomon II. Baxter, wishing to become members, they were balloted for and accepted, and came forward and received the Entered Apprentice degree. A dispensation having been granted for sufficient reasons by the District Deputy Grand Master, who was present, the above named persons were Passed and Raised to the sublime degree of Master Masons. The officers chosen were regularly installed by the District Deputy Grand Master; George W. Swift, Worshipful Master; Benj. F. Tucker, Senior Warden; George W. Donaldson, Junior Warden; William Hewins, Treasurer; Frederick Davis, Secretary; James P. Garvin, Senior Deacon; Thomas L. Swift, Junior Deacon; Solomon H. Baxter, Tyler. Visiting Brothers present: B. S. Pope, District Deputy Grand Master; George Marston; Major S. B. Phinney of Barnstable; Silas J. Bourne; Ferdinand G. Kelley; Bro. Childs; Bro. Hallett; Bro. Bearse; Bro. Simmons; Bro. Baker; all from James Otis Lodge, Barnstable. Brother Nye was very active in getting the Charter returned and after the first few meetings at his house the Lodge hired and fitted the rooms over what is now the Falmouth Coal Office. They remained there a few years, when they bought this present building, the same that they had occupied in 1801. Marine Lodge has now the original Charter granted by the Grand Lodge, dated 1798. It owns the building it now occupies. It has a Charity Fund of a few thousand dollars. It has one hundred and eighty-six members. It has sixteen Past Masters, and two Past District Deputy Grand Masters living at the present time. By Worshipful George H. Greene. During this meeting the following action was taken: "Voted that every visiting brother shall be allowed to make one visit free of expenses, but every other visit he shall pay 25 cents, unless otherwise determined by vote." They continued to meet at Brother Swift's until sickness in his family compelled them to meet elsewhere. They next met at the home of Samuel Shiverick, in the southwest upper chamber, his house being the old one next west to the Post Office in Falmouth Village. They continued to meet in dwelling houses in various parts of the village until the new building was completed in 1801. A meeting of the subscribers for the new building was held in September, 1798. "We the subscribers jointly and severally agree and engage to pay the sums annexed to our names by us subscribed into the hands of the committee who may be appointed to carry on the building of a School House where the old one now stands. "A list of subscribers for building a School House in the town of Falmouth and what number of shares each one has and money paid one whole share being $7.42." At a Proprietors' meeting, held at the Inn of Shubael Hatch, August 19, 1800, it was voted that the sum of $15 that the old building sold for, be paid to Elijah Swift for two feet in addition to the width of the new Schoolhouse. On completion of the new building the Town occupied the lower rooms for school purposes. The Lodge occupied the upper room and continued to occupy it until about 1810, and then for some reason not given, they returned their Charter to the Grand Lodge, where it remained until 1820. During that year it was returned to the Lodge and they continued to meet until about 1832 or 1833, when the Charter, working tools and jewels were again returned to the Grand Lodge and remained there until 1856. After giving up their Charter, the building was sold to Thomas Swift, who rented the lower rooms for store purposes and the upper hall for a school room. It was so occupied until a new school house was built. In 1856 a petition was drawn up by the old members of the Lodge and forwarded to the Grand Lodge asking that their Charter and records be returned and permission be given to re-organize once more. The petition was granted and the Lodge was re-opened under the old Charter. The first meeting of the Lodge after the Charter had been returned was held at the home of Brother Albert Nye and opened on the first degree. His house was the one now owned by Harry V. Lawrence. Applications having been received from James I. Dillingham, Thomas L. Swift and Solomon H. Baxter for the degrees, they were balloted for and accepted, and came forward to receive the Entered Apprentice Degree. A dispensation having been granted for sufficient reasons by the District Deputy Grand Master, who was present, the aforesaid candidates were passed and raised to the sublime degree of Master Mason. Visiting Brothers present were: R.W. Rufus S. Pope, District Deputy Grand Master, George Marston, Major S. B. Phinney, Silas J. Bourne, Ferdinand G. Kelley, of Fraternal Lodge, and Brothers Childs, Hallett, Bearse, Simmons and Baker, all from James Otis Lodge of Barnstable. Brother William Nye was very active in getting the Charter returned, and the first few meetings were held at his home, after which they hired and fitted the rooms over what is now the Falmouth Coal Office. They remained there a few years, when they bought the building on the site where the present building now stands — the same that they had occupied in 1801. The history of Marine Lodge to this point, June, 1923, was written by Right Worshipful William H. Hewins, Past Master of Marine Lodge, and read by him at the 125th anniversary held at that time. This anniversary was celebrated on June 24th and 25th, at which time Most Worshipful Dudley H. Ferrell, Grand Master, and his Suite officiated. It was attended by over two hundred Masons. At the regular meeting in March, 1930, a very delightful party was given Right Worshipful William H. Hewins to celebrate his ninetieth birthday. Brother Hewins informed the Lodge that the gavel which we now use was made by Captain John Hamblin of West Falmouth from bones taken from a whale he killed at sea. He presented it to the Lodge along with a twenty-four inch gauge, which has since been lost. In 1935 funds were collected and the present building was erected, the corner stone of which was laid by Most Worshipful Claude L. Allen, Grand Master, on May 24, 1935. It was also dedicated by Grand Master Allen on April 27, 1936. Since 1923, Marine Lodge has been very prosperous, increasing in membership from 186 members to 268 at the present time. We also have twenty-three Past Masters and three Past District Deputy Grand Masters now living. Marine Lodge has today the original Charter granted by the Grand Lodge in 1798; she owns the building we now occupy; she has a Charity Fund of several thousand dollars. During World War II, fifty-two members of Marine Lodge responded to our country's call, three of whom made the supreme sacrifice. By Worshipful Robert J. Tilden. We know from Falmouth tradition, as well as the archives of Grand Lodge, that Marine Lodge, A. F. & A. M., was chartered and duly constituted a century and three-quarters ago. The names of Frank Wicks, Joseph Webb, Robinson Dimmick, Isaac Parker, Prince Hatch, Davis Swift, John P. Caswell, Hugh Donaldson, Timothy Crocker, Richard Bunker, James Wing and Lewis Parker appear on the petition; and we now honor their memories as the Charter Members. Where and when had these men been initiated ? As leaders in a maritime community, some, it may be assumed, had traveled to larger ports or lived abroad. Colonial America had a generous supply of Lodges distributed from Maine to Carolina, as did several British Colonies in the Caribbean. But in what Lodge and under the jurisdiction of what Grand Lodge they took their first Masonic steps still suggests further research. The Charter itself duly signed by the officers of Grand Lodge carried the date March 13, 1798. The minutes of Marine Lodge record that the first meeting of our Ancient Brethren was held on March 26, 1798. The first meeting place was the home of Stephen Swift, probably the only member of Marine Lodge ever chosen Senior Steward in his own home. Brother William H. Hewins, writing for the 125th Anniversary, identified the location of the Stephen Swift house as "being the old house next east of the Town Farm." Brothers with shorter memories of Falmouth will need to know that the Falmouth Artist Guild now occupies the buildings once used for municipal charity, and that a granite marker formerly situated between the Recreation Building and the General Swift Motel (now replaced by the Holiday Inn) memorialized the site of General John L. Swift's birthplace. A bronze tablet carried the notation that: "The Marine Lodge of Free and Accepted Masons occupied it at one time for its meetings." Would it not be an appropriate part of our anniversary observances to seek the restoration of this historic marker? When sickness in the family of Stephen Swift compelled the Lodge to seek other quarters, it met in the home of Samuel Shiverick, "in the south west upper chamber." The site of this house is now occupied by the Post Office. Meeting in private homes continued until the "new" building was completed in 1801. The construction of our first Lodge Hall is an interesting example of the cooperation of individuals concerned about public education, the Town (which annually expended $400 for schools), and the Lodge. A few months after Marine Lodge was chartered, fifty subscribers pledged themselves to buy eighty shares, "in company with the Masonic Society if they chose to join us," to fund the building of a school house "where the old one now stands." The Town was also invited to participate "so far as they may agree for the benefit of a town house." Heading the list of subscribers for the school were Timothy Crocker and Frank Wicks, charter members and the first Master of Marine Lodge. Four other charter members can be identified among the subscribers, including Elijah Swift, the second Master. A year later, 1789, the school house proprietors voted to complete the outside of the building and to lay the floors equally with the Masonic Society. W. M. Elijah Swift received the contract to build the structure, and Brother Timothy Crocker received the money from the subscribers and signed the contract in their behalf with Swift. On completion of the building the town occupied the lower rooms for school purposes. The Lodge occupied the upper rooms, meeting there until about 1810. For reasons not yet known, the years 1810 to 1820 were dormant ones for Marine Lodge, with its charter surrendered to Grand Lodge. In 1820 the charter was returned, and meetings resumed under the leadership of Aaron Cornish, who was Master from 1824 to 1829. According to Brother Hewins, the Lodge continued to meet until about 1832 or 1833, but the names of the officers seem to have been lost. At some time during the latter year the charter, working tools, and jewels were again returned to Grand Lodge and remained there until 1857. The second period of darkness is more easily understood and suggests that Falmouth was closer to the main stream of national events than might have been supposed. In 1826 the mysterious disappearance of William Morgan had so shocked the nation that the anti-Masonic party was born. Shrewd political leaders determined to exploit popular anti-Masonic feelings in order to unite divergent elements against the rising Jacksonian Democracy. Jackson had frequently spoken in favor of the Order and his stature as a Mason was widely known. The seven electoral votes of Vermont in this election of 1832 was the high tide of the movement politically, but more time was required for social animosities to abate. It is now generally conceded that the anti-Masonic movement was caused by political and social conditions of the time, rather than a result of the Morgan episode, but its impact upon Falmouth and upon the fortunes of Marine Lodge was no less severe for being part of a national movement, however transient. It was 1857, almost a full generation after the Lodge closed, before a number of old members petitioned Grand Lodge to restore their charter. The first meeting following the return of the charter was held in the home of Albert Nye better known to the present generation as "Mostly Hall." Also at the first meeting applications were received from three applicants who were balloted for and accepted. The District Deputy Grand Master being present, he gave the necessary dispensation and the Lodge proceeded to confer all three degrees on all three candidates. In addition, they reorganized the Lodge, electing and installing a full roster of officers. After meeting for a time in Brother Nye's home, the Lodge hired and furnished rooms over the Falmouth Coal Company office. They remained there a few years and then bought the building on Main Street which had replaced the school house of 1801. You recall that the Proprietors of the School House had shared with the Masons in the construction and use of the "new" school. About 1810 the lights went out in the Lodge Hall; they apparently went out in the classroom as well, and the building passed into private hands. "near the old Academy, so called. . ." The following year Henry H. Shiverick also conveyed to the same Trustees, "all my right in and to the second story of the building (formerly the Proprietors' School House and Masonic Hall) with the privileges of a stairway at the west end of the building together with the undivided privilege of the land under and around said building . . . being all the property conveyed to said school district No. 9 by Thomas Swift. members of the Marine Lodge of Free and Accepted Masons of Falmouth . . . a certain parcel of land . . . near Shivericks Pond . . . containing one fourth of an acre . . . with the buildings thereon. One can only speculate what tides of fortune brought about this transfer. Whether the Odd Fellows were moving to larger or to smaller quarters does not appear. Perhaps they remained, sharing the same hall as tenants, as they did during recent years. Whatever the circumstances, we can well imagine the pride with which our Brothers moved into the new facilities. Home at last! The significant fact is not so much that the Lodge acquired its present property more than a century ago, but that it returned to the site of the building in which the Lodge met from its earliest period, i.e., 1801. Except to change the form of record title from "the members of Marine Lodge to Trustees, it is my belief that the title to the property has never since left our possession. As the purchase of a lodge hall indicates, the second half of the 19th century was a period of resurgence and continued development for Marine Lodge in particular, and for Masonry generally throughout the country. One need not accept the literal accuracy of the anecdotes of many Masonic writers to share the popular conclusion that the agonies of the Civil War which took thousands of men from hearth and home to struggle in alien surroundings, gave new significance to,their fraternal ties and demonstrated the value of shared Masonic affiliations. To those familiar with Camp Edwards and Otis Air Force Base, it may seem strange to consider the experience of the Civil War noteworthy. Whenever servicemen are stationed within the length of our cabletow we are accustomed to confer degrees as a courtesy to other lodges. Many servicemen have joined our Lodge while stationed here, and many, many more visit with us regularly. The steady growth of Marine Lodge during the second half of the 19th century is also remarkable when the population of the town declined from the time of the Civil War to the turn of the century. Ably managed by Worshipful Brothers William W. Peters, Evan W. Moore and Howard R. Delano as Trustees, our Lodge Hall also provides facilities for meetings of the Order of the Eastern Star and the Order of Rainbow for Girls. The work and the objectives of both organizations we enthusiastically applaud and support. Two commercial tenants contribute to the financial strength of the property and make possible our remaining on Main Street. This occasion was the beginning of twenty-five years of growth for Marine Lodge. At the 125th Anniversary in 1923, we boasted 186 members; at the 150th Anniversary in 1948, we had grown to 268. The Secretary informs me we now number 416, approximately half of whom reside in Falmouth and an equal number throughout the country. For a fraternity which conducts no membership drives, this is a flattering record and, I believe, better than the corresponding figures for Grand Lodge. We are still too close to this period of our history to view it with any clear perspective. Physically, the Lodge continues to) occupy the same building which was so lovingly constructed in 1935 and 1936. Numerous able Masters have in their time worked to beautify and adorn the several apartments of the Temple. I remember the late Wor. George H. Potter's urging, "Let there be lights," and there were lights as we had never known them before. Many a candidate, waiting to be received, has pondered on the square and compass Wor. Samuel H. Wright had inlaid in the anteroom floor. I well remember fraternal debates between Brother Ernest A. Sterling, an operative as well as a speculative architect, and the late Brother Jack Overy, an equally versatile craftsman, on how best to reconcile the Master's ambitions and the Trustees' budget. The dining hall, the heating plant, the ventilation system, the elevator are all eloquent memorials of a continuing tradition that a Master of Marine Lodge must have wisdom to contrive, strength to support, and beauty to adorn the Lodge building as well as all other great and important undertakings. Current proof of the present vitality of this tradition may be found in the renovations recently carried out under the leadership of our most junior Past Master, Wor. Kenneth C. Smith. The roster of the other Past Masters need not be recalled. Each has played his part and each has made his unique contribution to the prosperity of our Order. I am sure that for every Mason the Master who presided when he first entered the Lodge, the Master who raised him, and the Master or Brother who labored so long and patiently to teach him the several lectures will always linger in memory as the special exemplars of Masonry. In that context, I cherish a special regard for the late Wor. George H. Bigelow, who received me; the late Wor. Gustave E. Anderson, who raised me; and Wor. Samuel H. Wright, who tutored me. For those who have gone through the chairs, the Master who started you in line and the Brothers who helped you learn the ritual can never be forgotten. For me these debts are due the late Wor. George H. Potter and Russell H. Brown. How many of us have been assisted by Russ Brown! For me, these men gave Masonry its form and substance, just as for each of you, others have done the same and more. But these are personal memories and no more the measure of worth for a lodge than for a Mason. Marine Lodge's fame is built on stronger facts. In recent years we have sent three officers to serve Grand Lodge: Rt. Wor. George E. Rose, as Junior Grand Warden; Wor. Elisha Robbins, as Grand Pursuivant; and the late Wor. F. Gordon Jaynes as Grand Lecturer. Everyone familiar with the duties of Grand Lodge officers gratefully recognizes that these avenues of service are supplied only by generous investments of time and energy by the incumbents. In earlier years the late Wor. Joseph R. Hall was known as Master. District Deputy, and Secretary, to name only a few of his roles. I doubt whether there was a member of the Lodge during his time whose Masonic experience was not influenced by Joe Hall. Similar mention should be made of Wor. Russell Hartwell Brown, Master and Secretary of Marine Lodge, Master of the Lodge of Instruction, High Priest of Orient Chapter, Eminent Commander of Sutton Commandery No. 16, and industrious worker in behalf of innumerable other related Masonic bodies. Enthusiastic boosters of Freemasonry, ardent ambassadors of Marine Lodge, these are two names writ large in our history. Of the same caliber are our three living District Deputy Grand Masters: Rt. Wor. Sumner I. Lawrence, Rt. Wor. Milton E. Williamson, and Rt. Wor. Howard R. Delano. By serving the District, they have brought honor to us. More important than the Masters and officers, I should like to mention the late Alden H. Boothby and Lyman J. Clark, two Brothers who for years worked to make Masonic service a reality. Those who knew them well remember the quiet fidelity with which they performed the duties and privileges of the Service Committee. Similarly devoted and of major importance to the work of the Lodge has been Brother Harold Ruschky, who has exhorted us to part with blood, that others might Live. Who knows how many lives have been extended because of his efforts. Nor should anyone infer that our Masonic service has been kept within the Order. Although no Brother runs for public-office as a Mason, many members have served and do now serve the general good through public office. As examples, I invite your attention to Wor. Roger L. Savery, County Commissioner, Wor. J. Edward Nickerson and the late Brother Granville Beale, former Selectmen; the late Wor. Milford R. Lawrence, Town Moderator for twenty years; Wor. Frank L. Nickerson, School Committee; Bro. Henry G. Behrens, Finance Committee; Wor. William W. Peters, Wor. Russell H. Brown, and Bro. Charles A. White, Planning Board ; and the late Wor. F. Gordon Jaynes as Town Accountant. In the Police Department Bro. Harold L. Baker, father of three Masters of Marine Lodge, including our present one, served as Chief for many years. Wor. Kenneth C. Smith is now a Sergeant, as was his father-in-law, Bro. Clayton W. Collins, before him. With many Brothers in the full-time, as well as the special, force we are well protected. One could — and probably should — continue in this way to mention other Brothers who have served the Lodge and the Town in various ways; cooks and craftsmen, town meeting members and civic committees are only a beginning. In trying to name some, I am certain to omit others. It is better to suspend while recognizing the contributions of many more. Thus, in numerous ways the members of Marine Lodge practice outside the Lodge the Masonic principles inculcated within it. Every fraternal history, however brief, should include some record of the banquets shared, the visits of the Most Worshipful Grand Masters and other distinguished Masons received, the anniversaries, the special nights, and other memorable occasions which have marked our followship. Some will recall the visiting degree teams; others, the times when half of those present wore service uniforms. Few will agree as to which are most noteworthy, so 1 leave each to his own memories. Let it suffice to say that the fellowship of Marine Lodge is a many-splendored thing, wherein each Brother makes his own contribution and finds satisfaction of his own particular need. By Wor. Robert A. Greenfield. We learn from Falmouth tradition, as well as from the archives of Grand Lodge, that it was in the heart of a few outstanding men consisting of a Doctor and a few Sea Captains to build a Masonic Lodge here in Falmouth. These men petitioned M. W. Paul Revere to constitute a Masonic Lodge in the small town of Falmouth. However, it was M. W. Josiah Bartlett who finally granted Marine Lodge its Charter on March 13, 1798. Marine Lodge is the twenty-fifth oldest lodge in the State of Massachusetts and the third oldest on Cape Cod (King Hiram's Lodge in Provincetown and Adams Lodge in Wellfleet being the oldest on the Cape.) The first meeting of Marine Lodge was held on March 26, 1798 in the home of Stephen Swift, who was probably the only member of the Craft to be chosen Senior Steward in his own living room. A granite monument, which sits on the grassy knoll in front of the Gus Canty Recreation Center, was erected to the memory of the first meeting place. On the monument is a brass plaque stating that the first meeting site sat 200 hundred feet to the east of the marker. The place is now the site of Falmouth Inn, across the street from the Dairy Queen. A sickness in the Swift family made it necessary to move the meeting place to the home of Samuel Shiverick, where it remained until 1801. The site of his home is now occupied by the Falmouth Post Office. The construction of the first Lodge building was a joint venture between the members of Marine Lodge and the Town of Falmouth. Shares in the building were sold; fifty Marine Lodge members bought eighty shares. In 1801, the Falmouth School Board agreed to share in the cost of the building with the Masonic Society. Wor. Elijah Swift, the second Master of Marine Lodge, received the contract to build the structure. Bro. Timothy Crocker received the money from the subscribers and co-signed the contract on their behalf, with Wor. Swift. The Lodge occupied the upper floor and Falmouth School District used the lower floor. The period between 1801 to 1820 were the first years of darkness for Marine Lodge, largely due to the fact that most of the members were seamen and, therefore, not in town often. Our Charter was returned in 1820 and there is no record of meetings held until 1824. In 1832 or 1833, the Charter, jewels, and working tools of Marine Lodge were returned to the Grand Lodge and remained there until 1857. In 1857, some of the older members of Marine Lodge petitioned the Grand Lodge to have the Charter restored. After it was returned, meetings were held in Albert Nye's home, which is now known as Mostly Hall. The members were unable to meet in the original Lodge building as it had passed into private hands. At that first meeting, with the District Deputy Grand Master present, three applications were accepted. With dispensation having been given, the Lodge proceeded to confer all three degrees on the three candidates. In addition, the Lodge elected and installed the new officers. After moving from Bro. Nye's home, Marine Lodge met over the Falmouth Coal Company's office. In 1862, Marine Lodge bought the original Lodge building from the International Order of Odd Fellows, bringing us home at last. During the latter half of the nineteenth century, Marine Lodge experienced a resurgence in membership as did Masonry nationally. Many believe that the agonies of the Civil War played a part in this resurgence causing men to reestablish their Masonic ties. Since the establishment of Camp Edwards and Otis Air Force Base, Marine Lodge has conferred degrees to many military men stationed away from home as a courtesy to other Lodges. Many servicemen joined Marine Lodge and an untold many others visited regularly. This spirit of brotherhood continues today. In 1935, construction of the present lodge building was started and a cornerstone was laid by M. W. Claude L. Allen, who returned a year later to dedicate the new building. 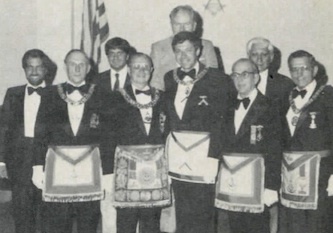 In 1987, Wor E. Joel Peterson and a committee of fellow Marine Lodge members, developed a plan to promote Masonic Awareness. The purpose was twofold: to inform the general public of the Masonic heritage that existed in Falmouth and to inform potential candidates of the procedures to become a member of this or any well governed lodge. They sponsored a Pre-Candidate breakfast, which explained the workings of Freemasonry. This breakfast produced 22 candidates for 1988 and has become the model and foundation for Masonic Awareness in Massachusetts. The Lodge hall provides facilities for the meetings of the Order of Eastern Star, the Order of Rainbow Girls, and the order of DeMolay, as well as other groups that have had the need to use the building for various meetings throughout the years. We have two commercial tenants also that have helped to make it financially possible for us to remain on Main Street. Physically, the Lodge continues to occupy the same site as the original building which was lovingly constructed in 1801 and reconstructed in 1935-1936. In 1990, the building was greatly enhanced by the addition of air conditioning in the Lodge room. In 1991, new vinyl siding and new thermal windows were added to the beauty of the building. Many Masters have given much of themselves and their time in effort to keep the building beautiful and in good repair. Wor. George H. Peters brought us new lighting; others brought us heating, ventilation, and a dining room. In 1972, Wor. Kenneth C. Smith did a renovation of the inside of the building. providing us with wisdom, strength, and beauty. dispersed over the face of the earth. By 1992, Marine Lodge has had eleven District Deputy Grand Masters of which three are still living: R. W. Frederick F. Jones, R. W. Howard R. Delano, and RW E. Joel Peterson. We have thirty-two living Past Masters, most of whom are still living in the Falmouth area and attend Lodge meetings regularly. December 27th, 1992, Marine Lodge saw the advancement of one of our own members elevated to the position of Grand Master, Most Worshipful David W. Lovering. During his term of office, March 8, 1994 we saw the recognition of Prince Hall Grand Lodge of Masons. In 1996 our own R. W. E. Joel Peterson was elected to office of Grand Senior Warden for the Grand Lodge of Masons in Massachusetts. In 1997 another one of our members, R. W. Peter R. Smith, was elected Junior Grand Warden of the Grand Lodge. We cannot forget the Master who received us into the Craft and the Brethren who have spent many long hours instructing us during our arduous undertaking of learning what it takes to become a good Mason. Let us not forget, but be ever mindful, that all of us, no matter to what plateau we ascend, we are all but workers in the temple, in our own way. In order to understand what life was like in the town of Falmouth at the time of the founding of Marine Lodge, it is necessary to go back to the turbulence of the Revolution and its aftermath. The Revolution was particularly hard on Falmouth for a number of reasons. A lot of its wealth was expended during this period due to the negative impacts of the war on many of its maritime means of livelihood and contributions to the war effort. Livestock was also depleted due to British plundering. Falmouth was literally on the front lines, with British warships and landing parties in the immediate area for much of the war. British interest was due to Falmouth's strategic position as a chokepoint for sea-borne communications and shipping (there was no railroad, highway system or Cape Cod Canal). Falmouth was also the strategic staging point for patriot political and military efforts to hold Martha's Vineyard, the Elizabeth Islands and even Nantucket. The British bases in the immediate area were in Tarpaulin Cove and Vineyard Haven, from which smaller vessels called "shaving-mills," of up to three masts, with a cannon on the bow and well-armed crews of about 25, roamed the coast looking for provisions and livestock, as well as patriot shipping. They were fast and maneuverable. They often landed to raid individual farms and homesteads. Falmouth has a long coast line, which was very difficult to monitor and protect. It was a war of long uneventful watches, false alarms, raid and counter raid, ambush and mixed loyalties. Only a fraction of these events were even recorded (usually due to some noteworthy or particular actions of an individual). There were clearly Tories who knew well the area and its people that sided with the British. These problems were compounded by the fact that the town was not self-supporting with respect to food staples. Some of the firefights involved ships with food stuffs, which sometimes changed hands several times. The local militia, under the superb leadership of Major (later General) Joseph Dimmick, was usually successful in these endeavors, which involved both land and sea actions. British frustrations with Falmouth led to the planned attack of April 3, 1779. Without prior warning from a known "Tory" on Pasque Island, the town would have been taken and burned. Four militia companies responded, Falmouth Center, North Falmouth, Sandwich Center and Sandwich Snake Pond, totaling about 200 men opposing an assault force of about the same number. It was a one-sided affair. There were no local casualties. The cannonading of the defenders and the town did little real damage and started no fires (believed due to the spring thaw). The assault forces being in open boats, while the militia was behind earthworks, were reported to have taken fifteen killed and twenty wounded, including the Tory commander. Interestingly, a very similar scenario was to be repeated during the war of 1812, involving the British warship Nimrod with about the same results. The situation in Falmouth after the revolution mirrored the rest of the country but was probably somewhat worse due to the proximity and duration of local war activity. There were huge national and state debts, confused and changing national governmental structure and a war ravished economy. The general confusion was great, there were disagreements and conflicts about what should be done (demonstrated by Shay's rebellion of 1786 in this state). Economic recovery did not start immediately. The new Constitution was ratified in 1788; Wor. George Washington was sworn in as the first President in 1789; and Congress passed in 1790 an act to redeem war-time paper money at $1 for $100 of paper. The State forgave Falmouth's unpaid Revolutionary War assessments, due to particular hardship. Falmouth was one of only four towns on the Cape to be so designated. These events worked to stabilize the situation and 1790 started a decade of prosperity for Falmouth. The first U.S. Census of 1790 (comparable 1800 census data are in parenthesis) lists 217 (268) families, 783 (910) free white males, 816 (931) free white females, with 38 (41) "free other" for a total of 1,637 (1882) free souls in Falmouth. The 1790 Census summary lists no slaves in Massachusetts, but there is reason to believe that this may not be completely true for Falmouth (detailed records indicate 2). The national numbers in 1790 were a total of 3,893,635 people, which included 694,280 slaves. The town's population was divided up pretty much as it is today, with a town center around the Green and eastward along Main Street, population clusters in Woods Hole, West Falmouth, North Falmouth and East Falmouth. The number of families indicates the number of houses in the whole Town. A road map of 1795 shows the Town's main roads as they are today, with Route 28 and Woods Hole Road, Main Street, Route 28 to Hyannis, Sandwich Road and Old Barnstable Road. The economic activities in the town involved agriculture, hay production of about 500 tons/yr (1802), sheep, cattle and orchards particularly being noted. There were eight mills in the town (1800), one a fulling mill and the others grist and possibly saw mills. Most were wind powered. There was also substantial salt production of 35,000 bushels/yr (1800), mostly located around Salt Pond, and maritime industries. There were 60 vessels owned in Falmouth averaging 55 tons in 1800. Six were fishing vessels (two fishing the Straits of Belle Isle and four fishing the shoals) and the rest were coasters. The majority of the coasters were involved in lumber and trade with the southern states, especially the ports of Charleston, Beaufort and Savannah. During this era many "mechanics" from the town went to the South in the fall and returned in the spring or early summer. These were the original "snow birds." "Mechanics" were skilled workers primarily in wood. They were probably mostly ship/house wrights, and carpenters. There are also indications that "prefabbed" houses may have been shipped south during this period along with the workers to assemble them. These winters in the South were stated to be a lucrative enterprise for the skilled craftsmen involved. The ship building era associated with offshore whaling hit Falmouth much later, starting about 1820. However, Nantucket had begun whaling about a hundred years before Falmouth. Men from Falmouth undoubtedly shipped out on ships from Nantucket and other ports. There was local shipbuilding. A shipyard did exist in Quissett harbor in 1802 and West Falmouth and Waquoit are also mentioned in this regard. The substantial amount of coastal shipping vessels used during this era had to be built somewhere in the area, but specific information is lacking. The religious life of Falmouth during the 1790's was dominated by only two sects: the "official" Congregational Church and the Quakers. Prior to the revolution there were only two exceptions Cape-wide, both Baptist, one in Harwich (1756) and the other in Barnstable (1771). The Methodists did not appear in Falmouth until the start of the 19th century, with the first meeting house in 1808 and first church in 1811. The first Episcopalian Church in Falmouth was The Church of the Messiah started in Woods Hole in 1852. The first Catholic Church, St. Joseph's in Woods Hole, wasn't founded until much later in 1872. It was not religious freedom but rather religious tolerance, and Falmouth was more tolerant than many other New England towns. It wasn't until the 19th century (petition to the General Court and a town vote, both in 1810) that Quakers and Episcopalian/Methodists were relieved of having to pay a church tax to support the local Congregational Church. However, as late as 1825 Congregational Church records tell of a committee appointed "to look up delinquents and bring them back to their duty." The decade saw a number of innovations in the Town. The first Post Office was established in 1795. The first Postmaster was Capt. Joseph Palmer, a former Revolutionary War Militia Company Commander. An inoculation Hospital for smallpox was established by Dr. Francis Wicks (Charter Member and first Master of Marine Lodge) at Nobska Point in 1797. It was isolated, due to the skepticism about the viability of the new procedure, with the nearest population being about ten houses in Woods Hole. There had been a smallpox hospital on Great Hill (Falmouth Heights), as early as 1777. Presumably it was an isolated site at that time. It was run by Dr. George Hugh Donaldson (Charter member and first Senior Warden of Marine Lodge) who came from England in about 1776. Dr. Donaldson was instrumental in bringing the vaccination technique to Falmouth by his correspondence with Dr. Jenner in England. Tradition says he overcame opposition by inoculating his own children and sending them to stay with small pox patients. On a different line, the first Poor House in Falmouth was established on Shore Street in 1800. There were a few contentious town issues during the 1790's. One issue involved problems resulting from animals running free. This got to the point that a town ordinance was passed in 1795 to ban pigs running lose. A town "Hog Officer" was appointed to enforce this statute. An other recurring issue involved the "center" of town. The town had grown eastward from the Town Green extending along Main Street. The controversy was about where to place the new meeting house and Congregational Church. The issue was finally settled by building two meeting houses, although the East End Meeting House was not a separate congregation until 1821. The first was completed on the Town Green (actually on the green, not its present location) in 1796 and the "town bell" made by M.W. Paul Revere was bought and installed the same year. In 1799 a town ordinance was passed to ring the bell at 6 AM, noon and 9 PM. This bell is presently in the tower of the church. The East End Meeting House was completed in 1797. Another issue involved the herring fishery, which was used primarily as a source of bait and was of some economic consequence. The controversy involved the damming of the streams for mills or other purposes, preventing the fish from going upstream to multiply. The core of the issue was conflicting rights of property owners versus public rights of access to the common resource fishery. The General Court in 1798 passed a law "regulating the fishing of alewives in Falmouth". Feelings got so high that in 1800 some town's people loaded a town cannon on the Green and then filled it with herring (aimed at someone's house maybe?). Unfortunately, when fired the canon burst, killing one person. There were also sufficient disagreements and unhappiness with town policy that the northern part of the town petitioned in 1797 to be allowed to secede from Falmouth and join Sandwich. This was strongly opposed by the rest of the Town in the General Court and the petition was denied. Interestingly, these issues are not that different from current town politics. Falmouth had been criticized by the State for deficiencies in its educational system both before and after the Revolution. The first permanent schools were not established until 1767. Before this time a teacher rotated around Falmouth teaching for 3 months in each "quarter" of the Town. The 1767 change established both a "man's school" and a "woman's school". The women's school was a form of "lower" school for younger less-accomplished students. The town in 1788 voted 140 pounds for a grammar school. However, The first specifically built school building of record in the town was built by private subscription in 1800 by Wor. Elijah Swift (second Master of Marine Lodge) for $675. It was a combination school and Masonic Temple for the newly chartered Masonic Lodge of Falmouth. This building still exists and forms the rear part of the current Marine Lodge. Well, what was the year 1798, the year Marine Lodge was Chartered, specifically like in Falmouth? The second President, John Adams, was in national office. The Governor of Massachusetts was Increase Sumner, elected the year before and destined to die the year after. The Selectmen of Falmouth were Jonathan Robinson, Samuel Nye, Paul Swift, Nathaniel Shiverick and Joseph Hatch. The Town was well into an era of prosperity, largely based on coastal shipping and other maritime endeavors. This era was to go on until about 1805 when European wars started affecting American maritime activities leading to the War of 1812 with Britain. There was a disquieting short quasi-war at sea with revolutionary France during the year of 1798, involving privateers on both sides. Capt. Rowland Crocker of Falmouth, in command of an American privateer, fought a battle at sea with a superior French vessel. He was severely wounded and his First Officer surrendered. He survived, was taken to France as a prisoner and got to shake the hand of Napoleon. He later had a long and distinguished maritime career as a ship's Captain. Rowland Crocker was the son of Bro. Timothy Crocker,(Charter Member of Marine Lodge) probably the Towns most influential citizen of the era who lived on The Green in the house later bought by Wor. Elijah Swift. Marine Lodge was founded during a period of growth, prosperity and relative peace. This was a Falmouth whose form and structure were not fundamentally different from the present time. The main differences today are — much greater scale, with greater diversity and a large number of tourists. Freeman, Frederick, 1858. The History of Cape Cod: The Annals of Barnstable County and of its Several Towns, Including the District of Mashpee, Vol. I (803 pages), Vol. II (803 pages), Geo. C. Rand & Avery, Boston, (Chapter in Vol. 11 on Falmouth, pp. 415 - 488). Geoffrey, Theodore, (Dorothy Wayman), 1928. Suckanesset: A History of Falmouth Massachusetts, 188 pages, Reprinted by Falmouth Historical Society with Index, 1992. Smith, Mary Lou, 1986. The Book of Falmouth, A Tricentennial Celebration 1686-1986, 582 pages, Published by Falmouth Historical Commission. It was a June evening but the cool breezes of the ocean blowing in on Cape Cod in Falmouth kept the gathering of distinguished Masons and the Lodge brethren in a happy mood as the work of the evening, under the direction of the Hellenic Square and Compass Club of Massachusetts, saw the Raising of the son of Worshipful George Marken, and his two co-candidates, to the degree of Master Mason. A full Lodge hall, composed of brethren of the fraternity from the Cape and from many parts of Massachusetts, enjoyed the work and the sociability that followed. In attendance, besides the Hellenic Club brethren, were: M. W. J. Philip Berquist, junior Past Grand Master of the Grand Lodge, who raised the first candidate in the short form; R. W. Frederick F. Jones, D. D. G. M. of the Hyannis 32nd Masonic District, who paid a fraternal visit to the Lodge on that evening; R. W. Robert O. Thayer, D. D. G. M. of the Provincetown 32nd Masonic District; plus many of the Craft who are friends of Bro. Marken, who came to honor him and his son on a very auspicious evening. The accompanying photo pictures the front row as: R.W. Bro. Jones; M.W. Bro. Berquist; Wor. E. Joel Peterson, Master of the Lodge; R.W. Robert O. Thayer; and Wor. George A. Marken, the father of the candidate, Gregory George Marken. The photo also pictures candidates Brothers Burton Aaron Butler and Andrew Steven Kariotis. The Grand Master presented the Meritorious Service Certificate to Wor. Jack L. Zimmerman and to top off the evening R. W. M. Mark Klein was honored with the Joseph Warren Distinguished Service Medal. It was one of the rare occasions when a Brother, member of the legal profession, appeared to be almost speechless. Thunderous applause greeted the men who had been honored. The tragic events of the morning of September 11, 2001, should never be forgotten. To honor those who perished and the courage and heroism of those brave first responders, Marine Lodge had a memorial constructed, and then presented it as a gift to the citizens of the town of Falmouth, Massachusetts. The genesis of this community project came about in September of 2011, when Freeport Lodge No. 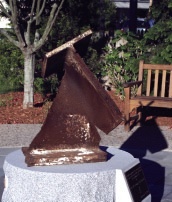 23 acquired two steel beams from the ruins of the World Trade Center in New York City, and gifted them as a memorial to the town of Freeport, Maine. The central figure in this effort was Most Wor. Charles E. Ridlon. Inspired by this example, a committee was formed at Marine Lodge to determine the feasibility of erecting a similar memorial in Falmouth. Committee members Rt. Wor. Ralph Sewall, Rt. Wor. James Franklin, and myself met and discussed the prospects over the next several months; all were in favor, but no one was sure how to proceed. I had a chance encounter with Daniel Altshuler, during a meeting of Massachusetts Consistory in Boston; Bro. Altshuler is a renowned sculptor, and member of The Tyrian-Ashler-Acacia Lodge of Gloucester. 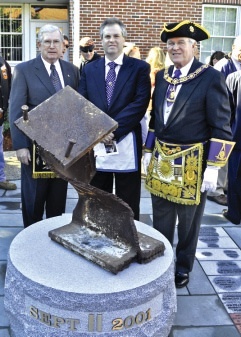 While discussing the idea of the lodge project, Altshuler mentioned that he knew the whereabouts of another large, mangled steel beam from the World Trade Center that had been part of a remembrance exhibit at the North Shore Arts Association in 2002 and was now in the custody of architect Richard Bernstein. An e-mail introduction was made, and Mr. Bernstein responded by saying that he had been waiting ten years for such a call and felt that a community memorial would be a most appropriate use of this moving artifact. He also said he would be honored to design the memorial and site plan. The steel secured, the next hurdle was to find a suitable location in town. Contacts with a town selectman led us to Falmouth Fire Chief Mark D. Sullivan. The chief enthusiastically agreed with the concept and was struck by the fortuitous timing of the request; a member of his department had recently asked his permission to construct such a 9/11 memorial, however the fireman had subsequently learned that the New York Port Authority’s steel distribution program had ended. Chief Sullivan suggested that a redesign of an existing memorial area at the fire and rescue headquarters on Main Street would be an excellent site. The lodge committee quickly agreed. At this point, there was an enthusiastic commitment for the steel coupled with an outstanding location for the memorial park. Everything was falling nicely into place! It was felt that, for this to be a Marine Lodge community project, all of the funding should come from the lodge and its members. The lodge committed a significant sum, and fundraising commenced with two generous challenge gifts from members. Ultimately, almost $10,000 in cash and in-kind gifts were raised by the lodge. Inspired by the lodge initiative, the Falmouth firemen decided to raise funds themselves to add a bronze fire helmet and bell, and a new flagpole to the park. To complete their part of the park, the firemen used the steel to assist their successful community fund-raising during the summer. In May, firemen traveled to Gloucester and transported the steel to Falmouth. It was loaded on a trailer, displayed in several locations, and was the subject of much interest. It also became the centerpiece of the Memorial Day parade. Architect Bernstein designed a comprehensive plan that included moving the existing memorial, the addition of the steel and fire department monuments, and the erection of a flagpole. A base of Barre granite was commissioned as a platform for the steel girder. Bronze lettering and a plaque were also ordered. A local contractor, Grafton Briggs Landscaping, was selected to complete the project and site work commenced in late summer. A large tree was removed to another location in town, the existing monument was repositioned on the site, and a concrete base installed for the granite. Lodge members designed and installed the lighting. The granite arrived during the remnants of Hurricane Isaac, and with time running short, the drilling of the stone, which was necessary to affix the bronze to the granite base, was carried out under a tarpaulin. Installation work continued for the granite base and steel along with the flagpole and two granite columns. Bluestone was added and enhanced landscaping was completed on time. M. W. Charles E. Ridlon, Past Grand Master of Maine; Bro. Daniel Altshuler of Gloucester; Grand Master Richard Stewart. Grand Master Stewart reads the certificate transferring custody to Falmouth; at left is Marine Lodge Master, Wor. Jayme K. Baker. 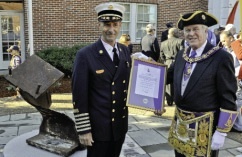 Fire Chief Mark D. Sullivan and Grand Master Stewart. 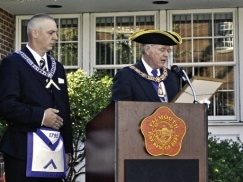 On September 11, 2012, seventy-five members of Marine Lodge, led by Worshipful Jayme K. Baker and Most Worshipful Grand Master Richard J. Stewart processed along Main Street from the lodge and joined 150 firemen and citizens already at the site. The fire chief led a program that included a blessing by a local clergyman, a pledge of allegiance led by local Cub Scouts, and the ringing of the last alarm at the time the first plane crashed into the World Trade Center building. Chain of custody of the artifact steel was transferred to the town by the Grand Master and Marine Lodge. One of the hallmarks of Masonry is networking. This project was truly a cooperative community effort involving Marine Lodge, members of the Falmouth Fire Department, and other people from Falmouth and beyond. A memorial to the September 11 tragedy — the Pearl Harbor Day of our generation — a day that changed everything, has been dedicated to the citizens and first responders of Falmouth, Massachusetts. All Freemasons, wheresoever disbursed over the face of the earth, can share in the pride of a job well done. Marine Lodge A.F. & A.M.
under OEM Request Number 0063.
and sacrifice of so many. Presented this 11th day of September, 2012. This page was last modified on 27 December 2018, at 11:48. This page has been accessed 60,504 times.